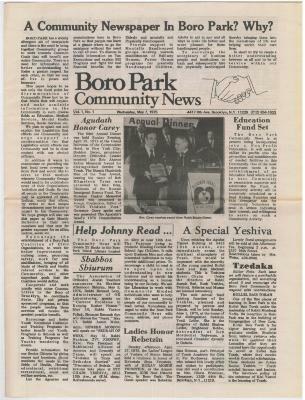 A Community Newspaper In Boro Park? Why? BORO PARK has a widely divergent set of viewpoints and there is the need to bring together Community groups to work towards Common Goals that will benefit our entire Community. There is a need for informition and better understanding to foster a greater respect for each other, so that we may all live in peace and harmony. This paper hopes to be not only the focal point for disemmination of Community News but to be that Media that will explain and make available information to the Community in such diverse fields as Education, Medical Services, Mental Health Services, Social Services etc. We plan to speak out and explain the Legislation that effects our Community and urge support or condemnation for that Legislation which affects our Community and be in close contact with our elected officials. In addition it wants to concentrate on providing the best local news coverage in Boro Park and would like to serve as that medium whereby Community Groups would send in for publication news of their OrganizationE Activities and Goals. So that all people in the Community may be appraised of ideas, feelings, needs that others, by virtue of their unique circumstances may be able tc impart to the Community We hope groups will also use this paper as their Montly Bulletins to their own members and thus earn fai greater exposure for an affair lecture, social etc. Encourage the establishment of a Boro Park Coalition of Civic Organizations, to work for better improvement in curbing crime, promoting. safety, work for area stabilization, bringing of all kinds of Health and Health related services to the Community, and other important goals that the Coalition would define. Cooperate and work jointly with other Commu-nities in the Boro of Brooklyn, to coordinate State, City and private sponsored programs, so that the people needing these services will receive the greatest possible benefit. Encourage and foster Youth Vocational Guidance and Training Programs to better benefit our Youth. Programs in Schools as well as Training Programs for Youths wandering the streets. Provide information for our Senior Citizens by giving names and locations, phone numbers for needs in the fields of Health, Housing educational, nutritional recreational, social and welfare services, etc. List the Agendas and organizations here in Boro Park so that people can learn at a glance where to go for assistance without the need to call all over. To discuss in details information on Tax Exemptions and explain SSI Programs and fight for real financial benefits for the Elderly and mentally and Physically Handicapped. Provide support to Mentally Handicapped groups working towards establishment of Half-way Houses, Foster Homes programs for mentally Handicapped Children, Adults to aid in any and all ways to make life better and more pleasant for these handicapped people. To encourage the acceptancy of business people and institutions to train and subsequently hire the physically handicapped thereby bringing them into the mainstream of life and helping enrich their own lives. In short to try to create a better understanding between us all and to be of service within our Community.